Oto Mboro is a porridge made with grated or pureed unripe bananas and vegetables. They are made with bananas which are good sources of potassium, vitamin B6, vitamin C and fibres. Oto Mboro is a delicious and healthy food. 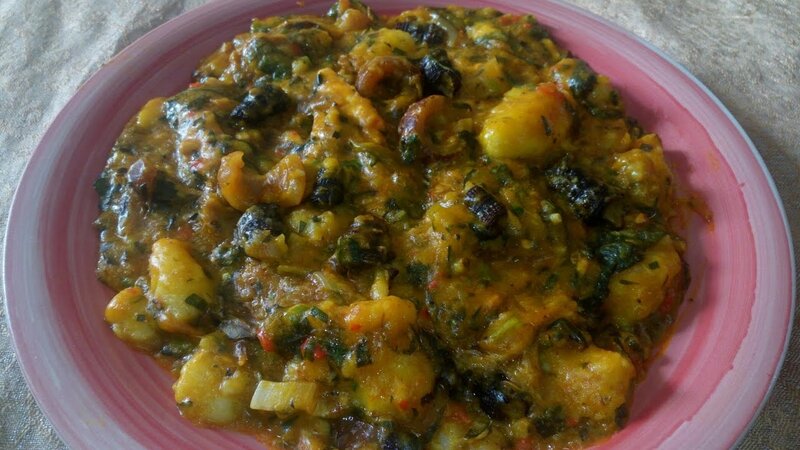 It is is a native staple to the Efik and Ibibio tribes of Cross River and Akwa Ibom states of South-South Nigeria.. They are part of the food given to their young maidens who are confined in the fattening rooms. It is high in nutrients but quite low in calories. Oto Mboro is also seen as ideal healthy weaning meal for babies. To take Oto Mboro a notch higher, leave it overnight in the fridge, then warm adding little palm oil and eat the next day. During this warming, a toasty crust forms at the bottom, making the taste similar to the treasured socarrat at the bottom of the Spanish paella. Wash the unripe green bananas and peel. Use a knife and scrape off the thin membrane covering the flesh of the banana. Use a fine grater, food processor or a blender to grate the bananas to a puree. Wash the meat to be used and season with salt, add half of chopped onions, pepper and a little water. Steam the meat until it is soft. Add water, dry fish, crayfish, palm oil and seasoning cubes. Stir and cover. Allow it to boil and cook for about 5 minutes. Add little salt to the grated banana and drop in spoonfuls using your fingers or a spoon, into the broth and cover immediately, do not stir. Cook it until the banana lumps firms up for about 3 minutes. Then, add chopped onions and stir gently allowing some breaking up of the banana lumps. Cover and cook until the sauce has reduced and thickened. You will hear a slight sizzling of the oil, then add the shredded scent leaf and stir very well. Cover and cook for about 1 minute and take off the heat. Oto Mboro is ready. To peel green bananas, cut off about 1 inch from the top and bottom. Run your knife along the ridges lengthwise as deep as the skin goes. Peel off the skin segment by segment. Failure to scrape off the thin membrane or long stringy bits on the flesh of the unripe bananas will result in your Oto Mboro having a tangy taste similar to the sourness in tomatoes. Do not overcrowd the pot with the banana puree, so that the boiling sauce will be able to cook and firm up the puree.